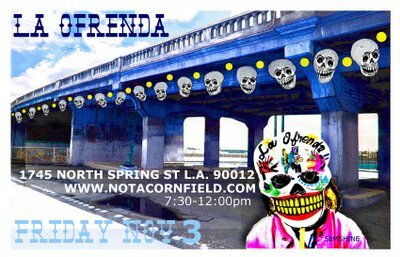 The general public is invited to join in honoring the Tongva ancestors at Cornhenge, the Metabolic sculpture, in the area previously know as Not A Cornfield. The indigenous community of Los Angeles honors its ancestors through this sunrise ceremony 5:45 a.m. Please join us. Bring your songs, your drums, your dances and your heart. 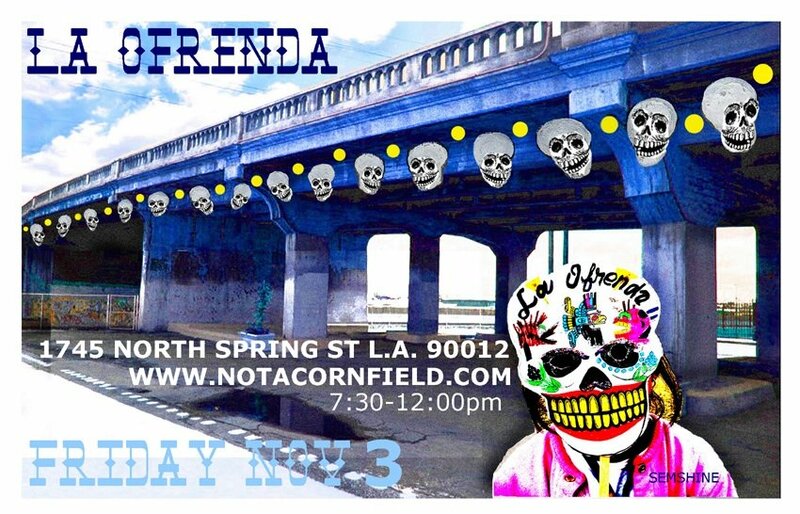 We will go in procession from Cornhenge to the Under Spring area, where a public Ofrenda will be accessible for the community to place their flowers, candles, photos, or any other remembrance in the name of their loved ones. This sunrise ceremony will commence the on-going activities at Under Spring for the next four days. Four distinct areas will offer a plethora of interactive events from, performance & visual artists, drumming circles, video/digital presentations, dances, live music, tamales, non-alcoholic beverages and more. Revolving around all this activity will be a Traditional Ofrenda for all who wish to remember their loved ones. You may place a picture, a momento, a candle or a flower to this collective community offering for the ancestors, to celebrate life. Fire circles and ambient music will make your viewing experience unforgettable. Please do join us from 3:30 pm – sunset. The water drums, the dolphin dance and the serpentine dance will take you into realms that heretofore you have not experienced. This is an interactive ceremony. If you are present you will participate. Please bring your parents so you can know that they are celebrating life together with you.